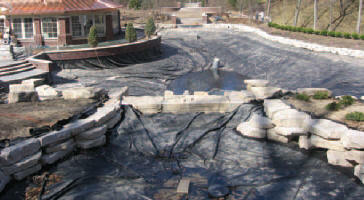 Flexible pond liners are by far the material of choice for the do-it-yourselfer. Using a flexible liner does not limit you to a specific size and shape as the preformed ponds do. EPDM Pond Liner is the #1 choice for water gardening because it is very flexible, puncture resistant, and long lasting. For lining large ponds, we recommend the polyethylene material because it is lightweight, easier to handle, and less expensive than rubber. Also, polyethylene liners can be made up to 60,000 sq. ft. in one piece. For a water garden, add the depth twice to both the length and width. Then add at least 1′ to both numbers for liner overhang. For a large pond, add the depth at the deepest point to the length plus the width. Then add 5′ to each figure to allow for burying around the edges. Always try to line your pond with a one-piece liner. There are special tapes available for seaming liners together, but do this as a last resort. Our EPDM liner has a 20 year warranty. Think about it: trying to save a few dollars on a cheap liner may well cost you a lot of time and aggravation in the end. If your liner cracks or punctures easily, you will have to drain the pond, remove all stones and the old liner, and start over. Save yourself the time and money; use quality materials the first time. Our 45 mm. rubber liner, when installed with the protective underlayment beneath it, will provide years of enjoyment for you. We have found that covering the liner in a water garden with natural fieldstone will help protect the liner from sunlight, animals, etc. Ponds also look better with a natural stone bottom, and if your water level drops a few inches, you won’t see a strip of liner exposed around the top of the pond. 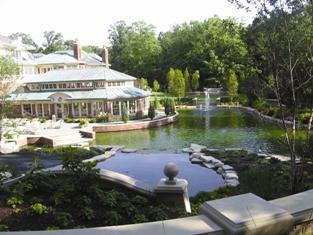 The stones also provide a large surface area where beneficial bacteria will grow and help clean the pond’s water. We recommend covering the liner in water gardens with 3″ – 6″ fieldstone then sprinkling 1″ stone over the pond to fill in the cracks between the larger stones. Feel free to mix in some larger stones for a natural-looking water garden.